It was released as War‘s lead single in January 1983. 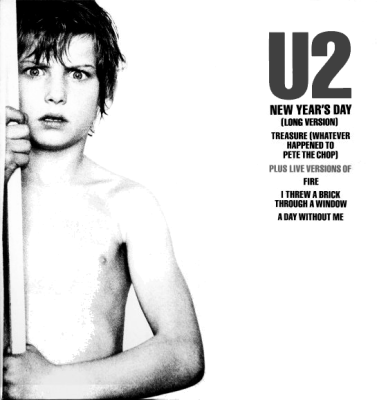 Written about the Polish Solidarity movement, “New Year’s Day” is driven by Adam Clayton‘s distinctive bassline and The Edge‘s piano and guitar playing. The lyric had its origins in a love song from Bono to his wife, but, as stated before, was subsequently reshaped and inspired by the Polish Solidarity movement. The bass part stemmed from bassist Adam Clayton trying to figure out what the chords to the Visage song Fade to Grey were. The video was one of their first to see heavy rotation on MTV. It was filmed in Sälen, Sweden in December 1982 and directed by Meiert Avis. The band only appeared in the performance scenes of the video as it was filmed in the dead of the Swedish winter. U2 guitarist Edge revealed in the official U2 biography that the four people riding on horseback in the video that appeared to be the four U2 members were in fact four Swedish teenage girls disguised as the members of U2 riding on horseback with masks over their faces. This was done as the band were frozen from shooting the video in sub-freezing temperatures the day before. Their biography states that Bono refused to wear any headgear despite the cold weather and had a lot of trouble mouthing the lyrics.The video also features footage of Soviet troops advancing in winter during World War II.